Okay, so Joie Studio's been at 40 fans on Facebook for like FOREVER. So to get our Facebook page going, I'm going to do a giveaway when we hit 50 fans on Facebook. And I will do a separate giveaway when we hit 50 followers on Twitter. Once we hit those benchmarks, I will pick a FB fan/Twitter follower at random to win Joie Studio's very first social networking giveaways. If you all like this and are willing to spread the word about the letterpress goodness that is Joie Studio, I will do giveaways again at 100 and 200. So fan up on Facebook and follow us on Twitter to double your chances to win! Stationery Show 2010, Part 4: New Letterpress Friends! 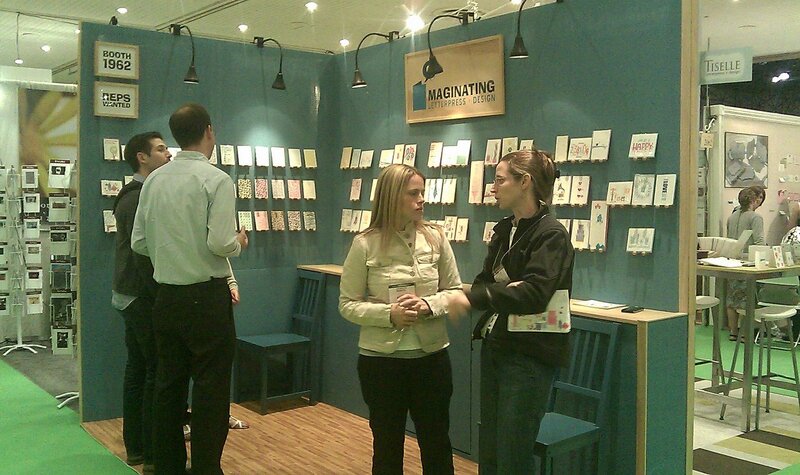 One of my favorite parts of the Stationery Show is meeting all of my fellow letterpress printers, whether it be wandering on the floor with me, or in their very own booths. I especially love seeing the awesomeness that my fellow stationers have come up with. Especially at Igloo Letterpress. I've been following Igloo's tweets for a bit now, but I didn't realize they had what I consider to be THE COOLEST holiday card around (see the second pic above). Two die-cut slits make the card a pop-up card with a cool fold to it! 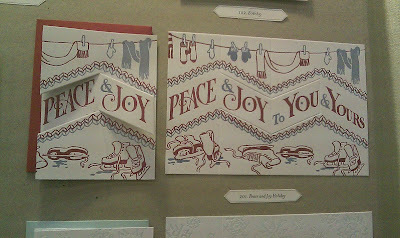 If it weren't for the fact that Joie Studio in fact makes our own cards, including holiday cards, I would probably send these cards as my holiday card. I also got to meet all the ladies at the Let Her Press booth and the Ladies of Letterpress booth, which was pretty awesome. I've been following Laurie of Lucky Bee Letterpress and her work for awhile, so it was nice to finally meet her. 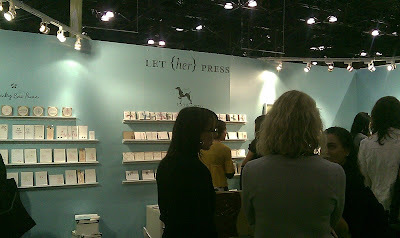 I also got to finally meet the Albertines of Albertine Press, and with much surprise and delight found out that Albertine Press follows Joie Studio's blog! 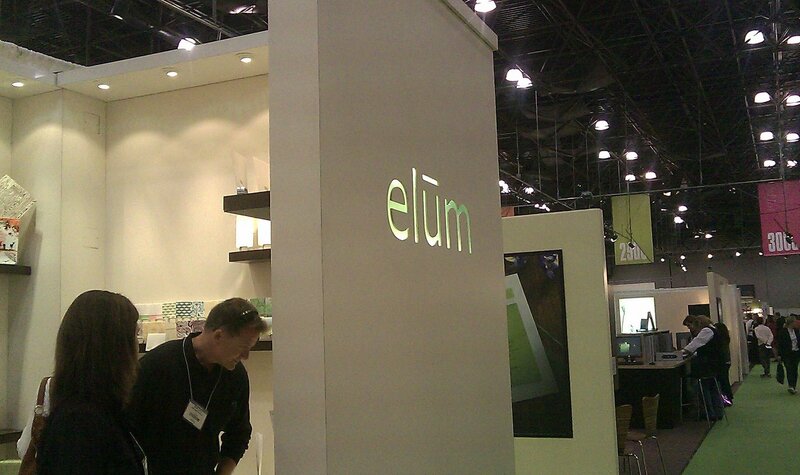 I also very much appreciated seeing the finished booth after reading about it on their blog. 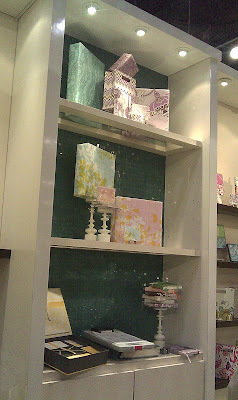 Anyhow, I have just one blog post left about the Stationery Show experience, so look out for it. Signing off for now -- bye! Today is Starbucks day for me. I'm sitting at a Starbucks right now. Gone, apparently, are the days where you needed to pay for a T-Mobile hotspot subscription. Now it's free for two hours so long as you have a Starbucks gift card that has been used in some way within the last 30 days. Sweet! I went from a client meeting at my Pasadena office (aka Starbucks) to my studio back out to meet another client in Glendale. Anyhow, my client meeting at my office in Glendale (aka Starbucks) went way faster than I had anticipated and I have a bunch of time to kill before my next meeting, so I figured I would continue sifting through pics from the Stationery Show. 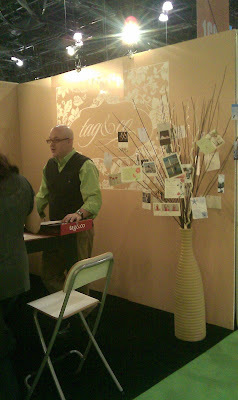 Here are a bunch of pictures of booths I really really liked. 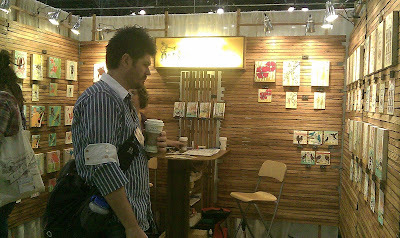 I don't know if I remember the paper goodness that were in the booths, but I certainly remember that I liked the booth designs A LOT. I think you can tell who they all are. The first two I really liked the bold colors. The third I thought the hanging of the paper goods on the branches was kind of a neat, different way of displaying the cards. The bottom one is Old School Stationers, I believe. I LOVE the wood look. It's not Joie Studio, but man does it look good. 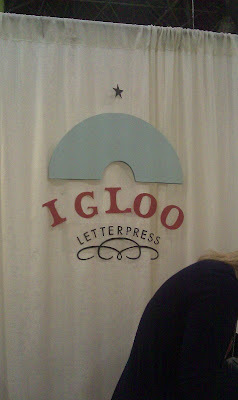 I had lots of fun meeting up with letterpress studios from Los Angeles! There were more but I kept forgetting to take pictures. 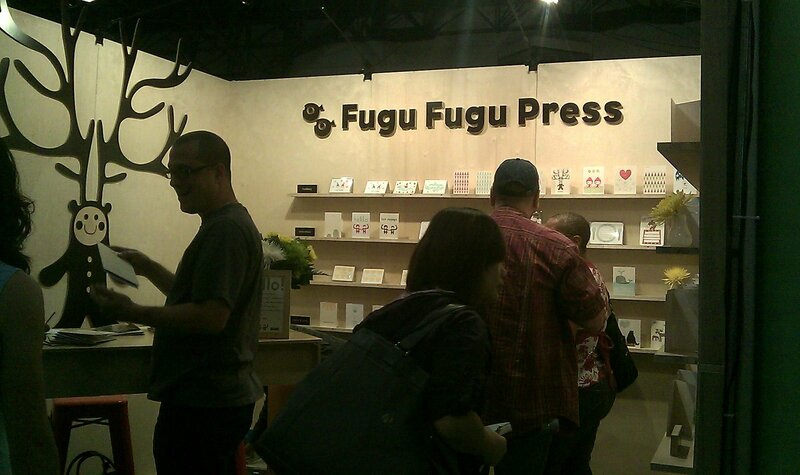 Fugu Fugu, of course, was present with their brand new booth walls, built in Pasadena and shipped to New York. Maginating & Tiselle also put up their own walls, which I find amazing. 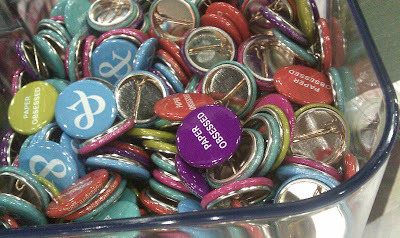 A little treat at Tiselle's booth was finding out that Tiselle's Dan is also Dan from college! Dan and I went to college together and were in the same dorm for a year. Always so funky. I also got to meet the fun kids that run Paper Loop Cards and Kelp Designs, who I met over Twitter (follow @joiestudio on Twitter! ), and a bunch of other people from Los Angeles including the ever elegant ladies from DeMilo Designs. It's rather interesting that there is such a huge number of people from the West Coast, but nothing quite like this on the Pacific side of the States. I do have to note that it does give advantage to card companies and studios on the East Coast, where they could potentially just drive their stuff to the show and save tremendously on shipping costs. Anyhow, more pictures to post and share tomorrow! 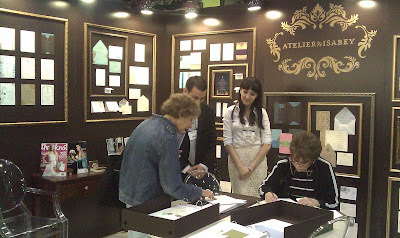 Okay, while I have half an hour at JFK, waiting for my flight back to board, I thought I would make use of the free Wi-Fi and start reporting back on what I saw at the National Stationery Show yesterday. Elum's booth, as usual, was gorgeous, complete with glass tile and everything. I love Elum's work -- I think that their letterpress is amazing both in design and printing, especially if you look at the registration and how exact their registration matches up. 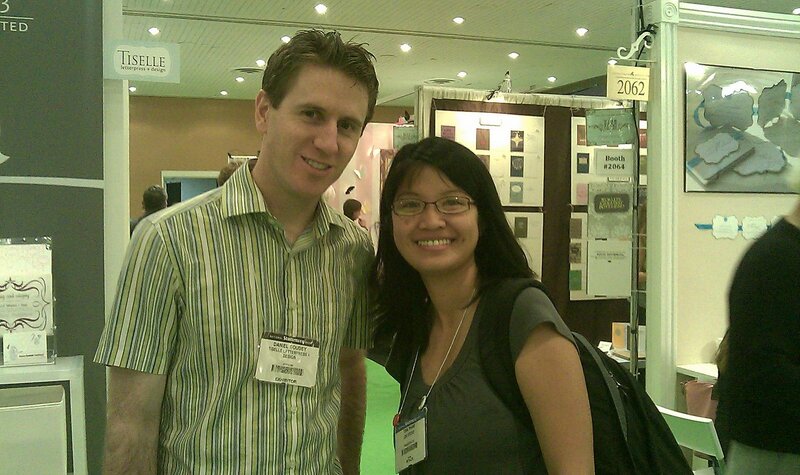 Plus I got to meet Long and Amy, who process my photopolymer plate orders! I caught up with Michelle of Blue Note Press and we walked the show together for awhile. She spotted Cathy from Boxcar Press (aka Smock Paper) and talked shop for a little bit. They have also made photopolymer plates for Joie Studio, so it was rather nice to finally put faces and names and voices and emails. Probably the most exciting news in terms of paper is that Waste Not (aka Paper Source) is introducing a brand new blue called Peacock (gorgeous!) and is finally bringing back a pastel yellow called Sunshine (lovely!) to replace Butter. Everyone was extremely excited about the new colors and they were already out of Peacock swatches (they apparently just figured out the color and it's not even in the 2010 swatch books), and as soon as I get back I will have to take some pictures to show you -- we grabbed some 5" x 7" sheets of Peacock to have our own samples, so I am so so excited to finally have this gorgeous color available. Okay, I made it through *most* of the Stationery Show today. It was lots of fun seeing everyone today and more than a little exhausting, too! It's 1a and I've just finished packing up to meet my car back to JFK at 6a, so there's not going to be too much more than these two pics right now, which are from Mohawk's booth, where I got to chat about the Felt and Wire blog and store and also pick up those neato buttons! I LOVE that they say Paper Obsessed. Definitely going on my printing apron. I actually got one in each color! More when I get back to La-La land, but for now, good night! Gosh, after a 5 hour flight and a cab ride from hell, I'm finally in Manhattan. I had to run out to get a toothbrush, but luckily it's the city that never sleeps! 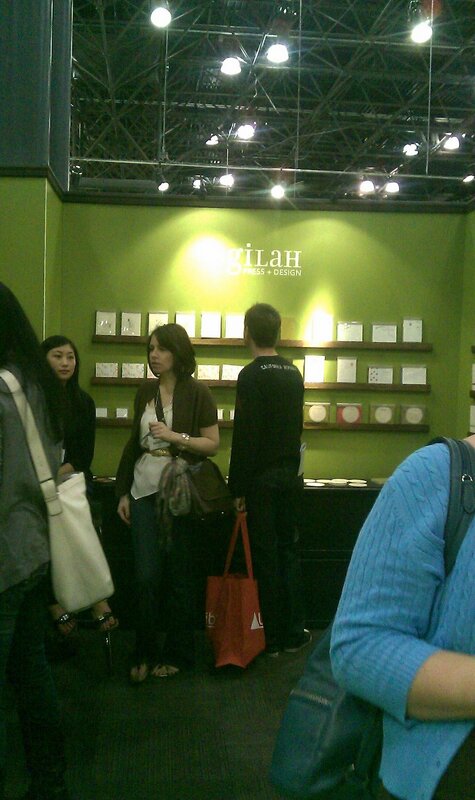 It's nearing 2am here and I've got a long day ahead of me tomorrow at the Stationery Show. I've got a camera and my cameraphone on me, so I'll try to take lots of pictures to share the experience with you. Anyhow, I gotta get to bed -- tomorrow I'm waking up nice and early and planning my attack strategy for the Stationery Show (which is probably honestly walking up and down each aisle), but I will need to make a short list of booths I absolutely must visit, including my friends at Fugu Fugu Press! Good night! 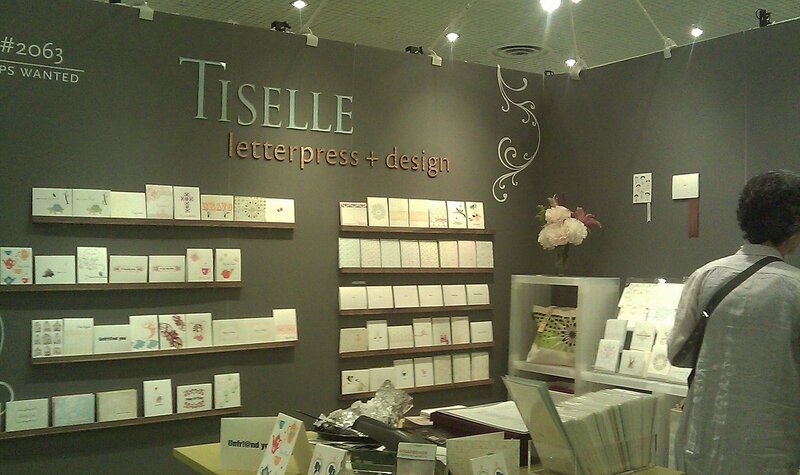 See you at the Stationery Show in the morning! It's okay. My husband knows. I have a great love of Mr. Bernhard. I lived in Vienna for a bit, Mr. Bernhard is Austrian. I love his fonts and use it every chance I get. 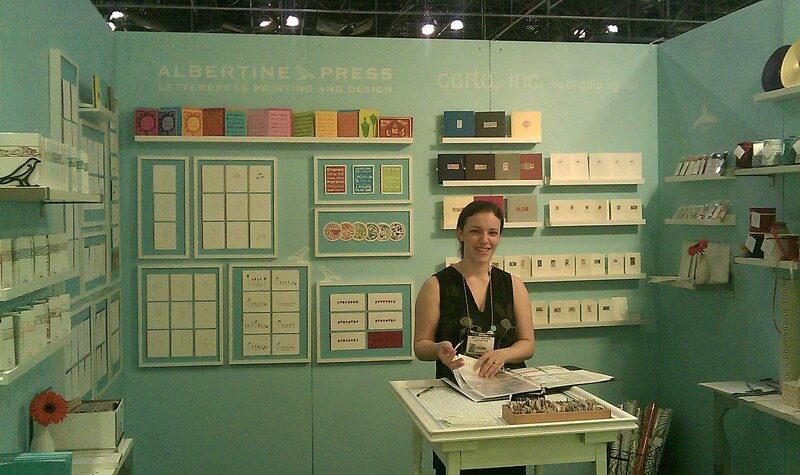 Now to pack and catch that plane to New York and the National Stationery Show! Introducing the newest member of Joie Studio...the youngest press here, a Heidelberg Windmill. I still have to get a press mechanic out to give it a tune up and help me wire it up, but I'm very very excited to have the Windmill here. 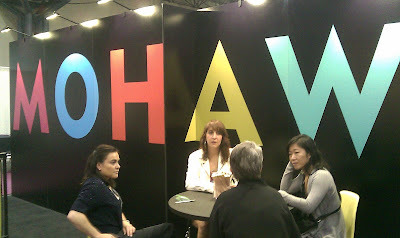 How awesome of an idea is this to collaboratively drive more traffic to booths? 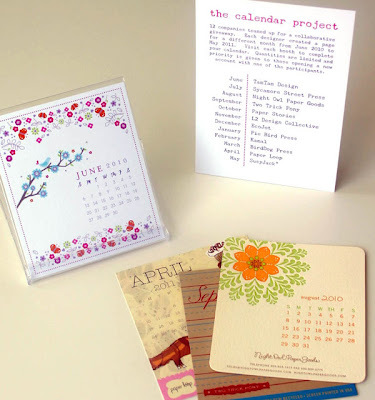 12 paper companies each took a month for this fun calendar available only at the National Stationery Show! Go to PaperLoop's blog for more info! I guess I have a project for myself in New York this Sunday! This will give me a reason to stop by all of these awesome companies' booths. It's busy in the print room right now. I've been mixing up new gorgeous colors for some custom letterpress jobs and some new items that I've been designing. Here's some picks as sneak peeks at some colors that have been on the press lately. I mix the ink to match envelopes by hand (or whatever swatch my clients give me). It's just a bit of love that goes into every print run that I do. And a peek at my ink shelf, filled with Van Son and Accent Ink cans. Now I gotta get back to work! You know, you might have seen this letterpress art print before on this blog, on one of the pictures of one of the art fairs that Joie Studio has attended. I haven't bothered to put them online thus far, but they'll be up in the shop soon enough. Here are some pics that I took of the art print. I have them in this color combination (sky blue & orange) and in pink and orange. The art print is 11" x 14", with the printed space being 8" x 10", so you can frame it with or without a mat. Letters are in right now! I went to Restoration Hardware looking for house numbers (actually I wanted to see what the house numbers from the catalog looked like), only to be told that they don't sell the house numbers in store anymore (really? 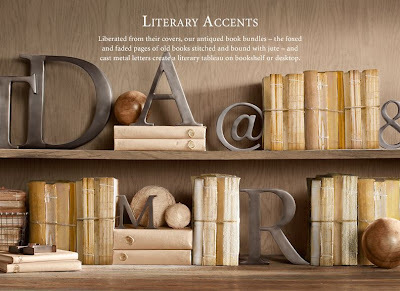 ), and where the house numbers used to be was a display of gorgeous literary accents. I'm not so hot up on the books without covers business in the pic above, but those cast letters and symbols are beautiful. I really wanted the "@" symbol, but mostly because in the type collection that I have there is no "@" symbol. I am loving this font. I had a design series on backburner that didn't have quite the right font...and I think Escorial font is it! I've been playing with this font for the last week and I am in love. Look for it soon. Yes!